generates power using the flow of gas through the pipeline without combustion of fossil fuels. 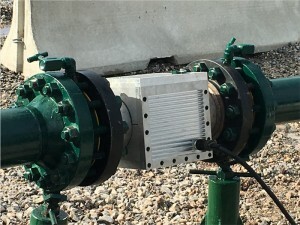 The IPTG is an electric generator contained in a two-foot section of 6”stainless steel pipe. It is installed using standard industry flanges. Feed piping may be flanged up or down to that size. The pipe is tested to 2,000 PSI. Magnetic flux produced by rotation of magnets on the turbine within the pipe produce electric current in coils mounted around the exterior of the pipe. The generator outputs through an umbilical cable to its control box that may be mounted conveniently near the site batteries and SCADA system for remote generator system monitoring through the existing site SCADA system. The IPTG overcomes the drawbacks of solar panels, thermal-electric generators, diesel generators, combustion turbine generators, and wind. It is less expensive, requires less maintenance, is resistant to damage, and burns no fuel, reducing the site environmental footprint. The In-Pipe Turbine Generator is designed to generate power 24 hours a day and be very low maintenance. Assuming no mechanical damage, there should be no maintenance required on the components external to the pipe.